So few have heard of it, yet worldwide it's seen as more common than leukemia, multiple sclerosis & muscular dystrophy combined! Over 1:1000 Canadian men, women and children are living with lupus. The ratio of women to men (who are affected) is 9:1. and the average age of diagnosis is between 15 and 45. Systemic lupus is a complex and sometimes baffling condition that can target any tissue or organ of the body, including skin, muscles, joints, blood and blood vessels, lungs, heart, kidneys and the brain. There are other types of lupus which mainly affect the skin. Few individuals develop drug-induced lupus as a response to some medications used to treat other conditions. These symptoms disappear when the person stops taking the medication. 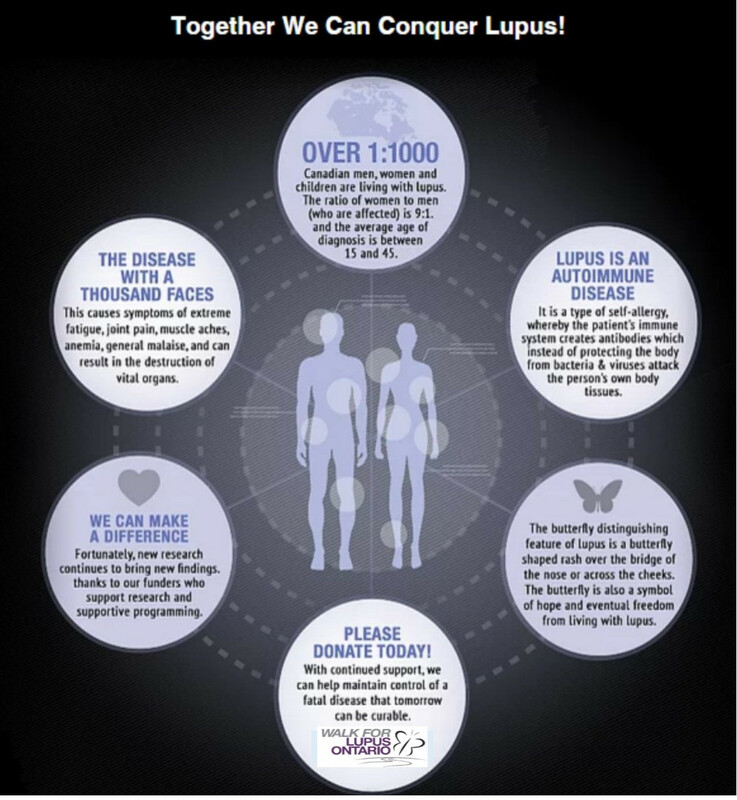 Visit www.lupusontario.org for more information about lupus and for a list of symptoms or contact Lupus Ontario at 1-877-240-1099. If you suspect you have lupus, please contact your medical doctor.